Waiting can be such a drag… but not with this Hermès that helps you find joy in waiting, keeping your eyes on L’Heure Impatiente. We go hands-on with this alarm watch with proper good manners, a respectable mechanical pedigree and a design that is both elegant and original. 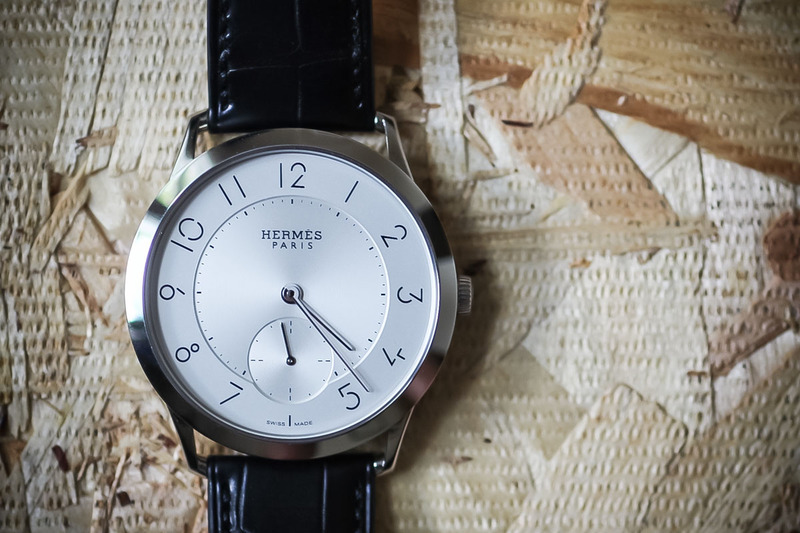 Some brands create rugged, technical men’s watches, but this is not the world of Hermès. The singularity of the Parisian House lies in a distinctive perception of elegance centred on discreet yet audacious style and refined craftsmanship. Transferring this identity to the world of watchmaking, Hermès has been seriously elevating its watch credibility over the past few years. With its poetic complication watches, the brand has been telling us stories with that Hermès different twist, playing with our perceptions of time. 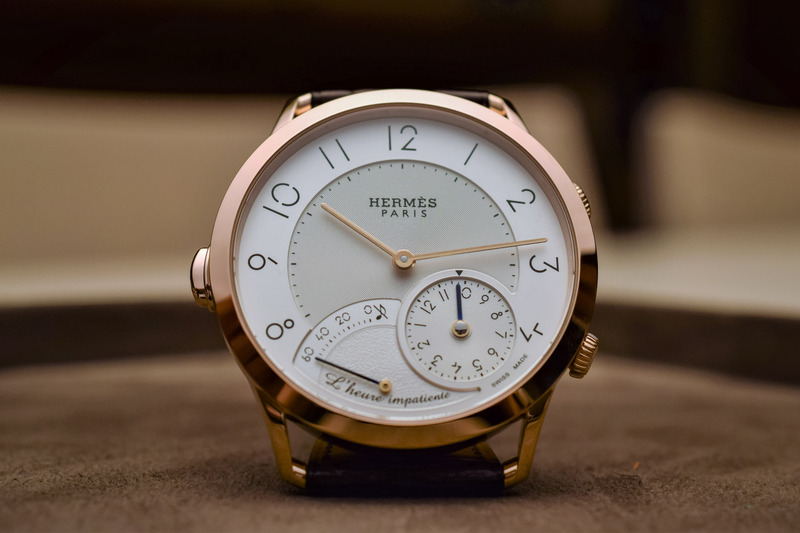 Following “Le Temps Suspendu” (time suspended) and “L’Heure Masquée” (time hidden), this “L’Heure Impatiente” (the impatient hour) by Hermès keeps playing with a different relationship with time. Unveiled at Baselword 2017 and housed in the elegant Slim d’Hermès, their latest emotional complication is indeed worth a closer look. Waiting can be such a drag… but with its L’Heure Impatiente Hermès allows you to enjoy the wait as you look forward to a much-awaited moment, with a delightful horologic novelty, and as always, in the brand’s inimitable style. All you need to do is to set a time of the day to be reminded. When the time has arrived, a chime rings out a single crisp note. One hour prior to this gentle reminder, a hand commences a 60-minute countdown on a retrograde scale and its progress can be followed to relieve your impatience. The function is activated by the pusher at 9 o’clock, and setting the time which starts the countdown and chimes on the 5 o’clock sub-dial is via the adjacent crown. The 2 o’clock crown allows setting the time. 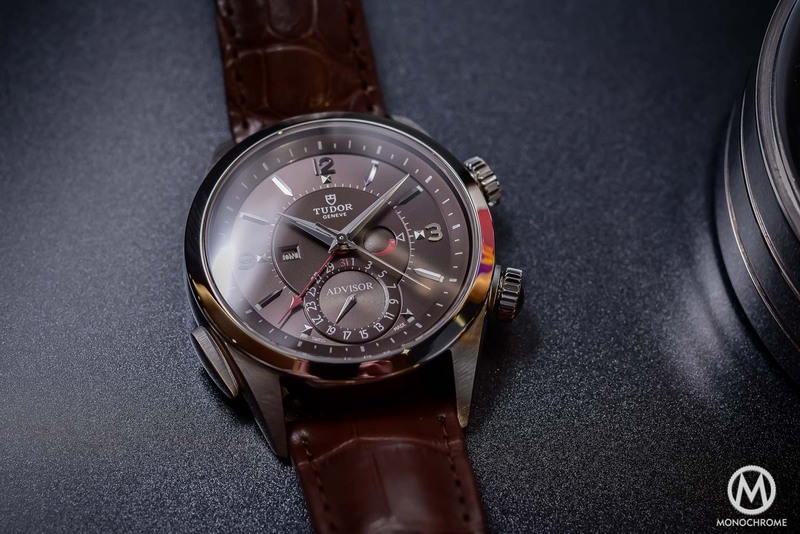 The dial has an opalin sliver finish with the uniquely written Arabic numerals designed by Philippe Apeloig transferred in black. The chapter ring has a sunburst finish while the center and the counters are snailed or grained. It is paired with 4N coated and blue lacquered baton-style hands. 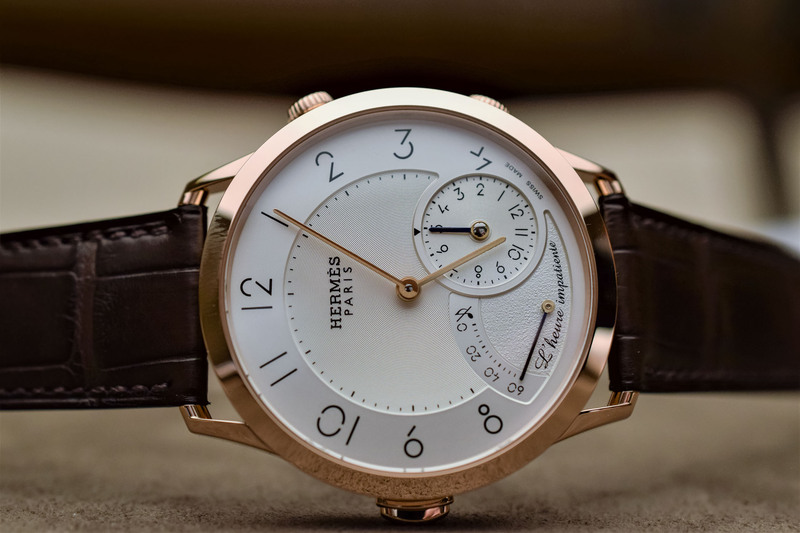 L’Heure Impatiente is fashioned out of pink gold and measures 40.5 mm in diameter. 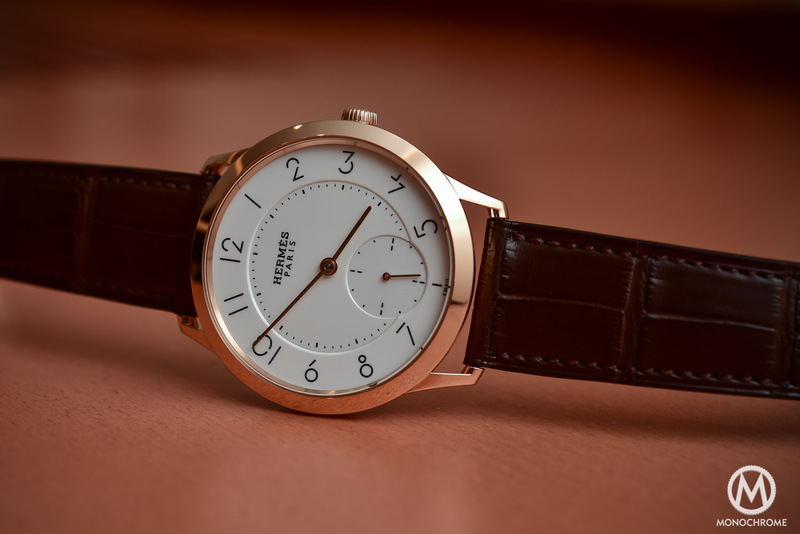 The case features the elegant lines and distinctive lugs of the Slim d’Hermès. On the wrist, it has a nice presence and it wears really well. The case profile is rather lithe given the complexity of the movement and the fact that the case was worked to enhance the acoustical properties of the chime, in particular, empty space to resonate (the more empty space in a case, the better it will be in terms of acoustics). L’Heure Impatiente is animated by a complicated movement. 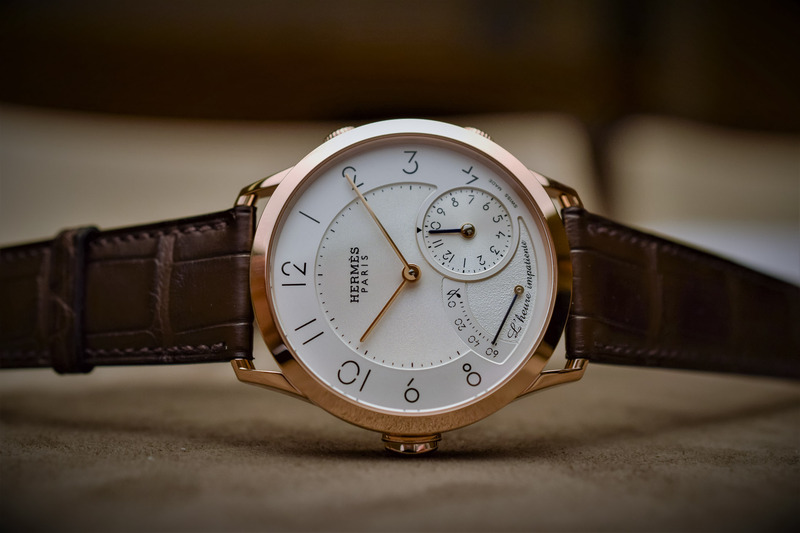 It is based on the ultra-thin self-winding Hermès H1912 manufactured with Vaucher (editor’s note, Hermès has a 25% stake in Vaucher). 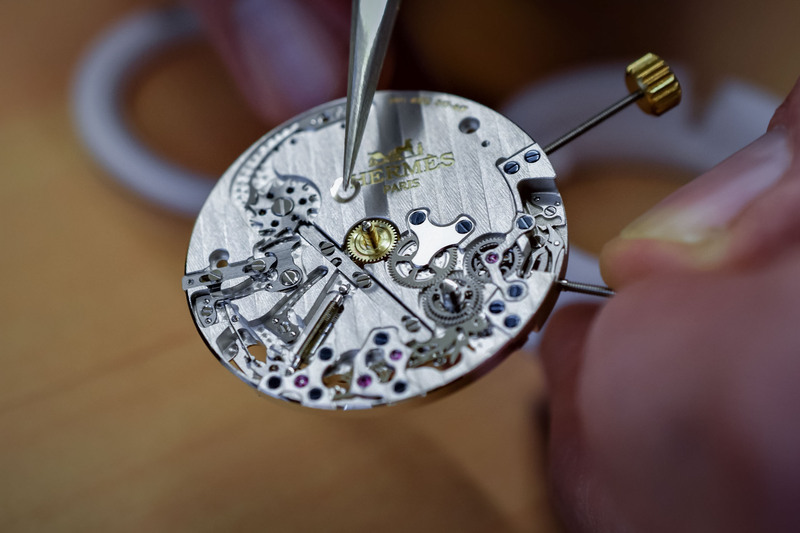 Once again, Hermès collaborated with Agenhor’s Jean-Marc Wiederrecht to design the complication module. 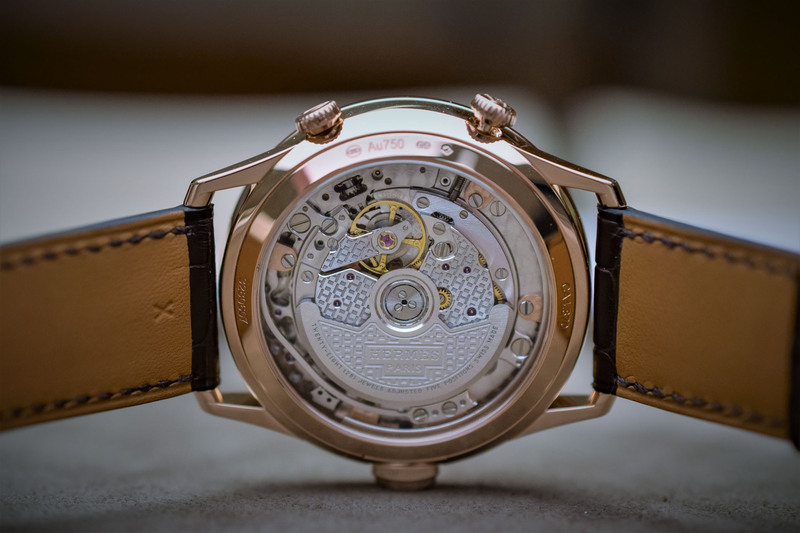 Over the past few years, Wiederrecht has earned a reputation as one of the most creative and talented independent watchmakers, operating behind the scenes with the development of mechanical movements for some of the most prestigious brands (Van Cleef and Arpels, Hermès or Fabergé among others). The module itself is the result of a five-year development, it is only 2.2 mm thick yet comprises no fewer than 131 components. 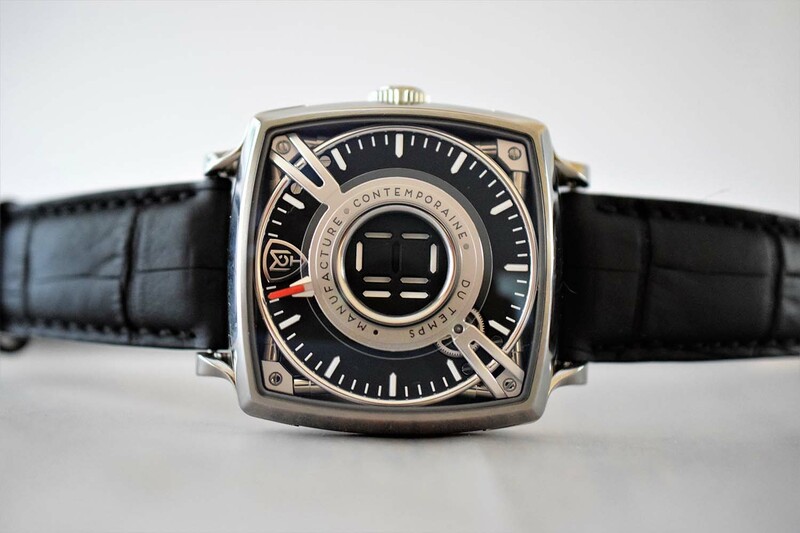 Even if they are not visible, hidden underneath the dial several components have been given a singular shape. A “shark” cam triggers the chiming rack/lever that is shaped as Pegasus, the mythical winged horse. The helical shape of the spring storing energy to power the hammer is also unusual. 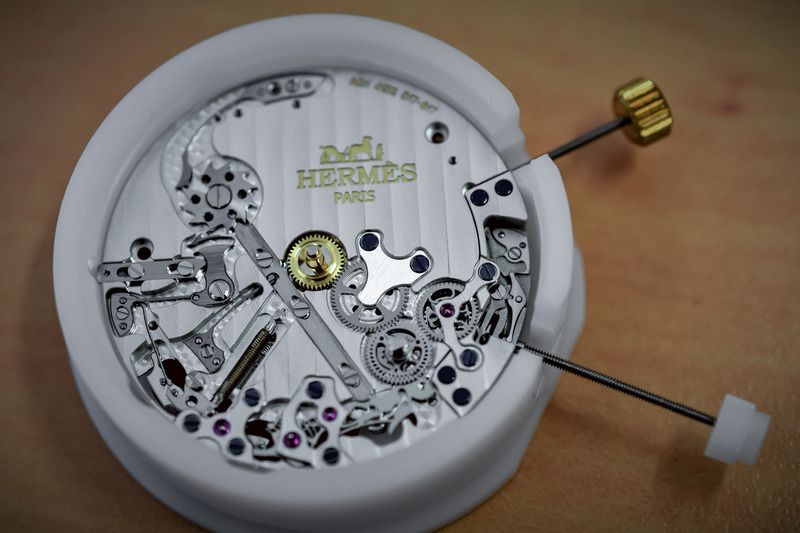 The calibre H1912 is nicely decorated with an Hermès H pattern while the module is finished with Geneva stripes. 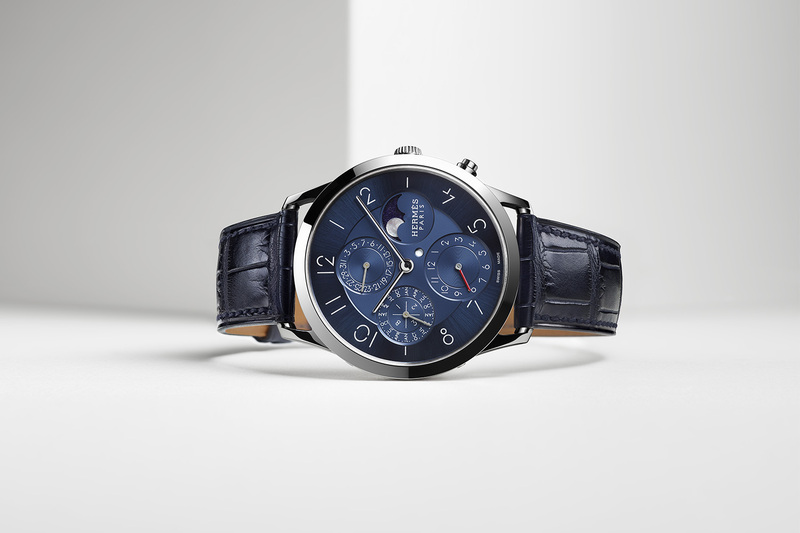 The balance is free-sprung and operates at 28,800 vibrations per hour for a power reserve of 42 hours. 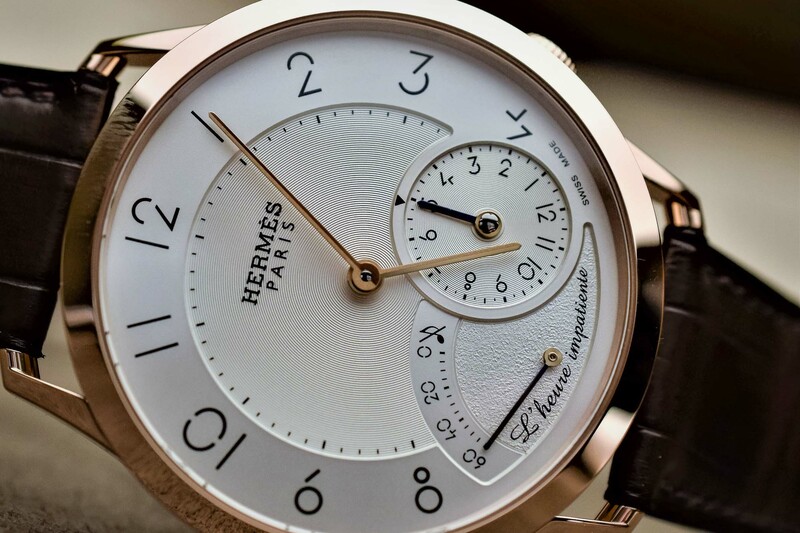 The Hermès L’Heure Impatiente is teamed up with a superb alligator strap secured with an elegant pink gold pin buckle. Price is set at CHF 35,000. For more information, visit www.hermes.com. I love the Slim d’Hermes line and this one is no exception. 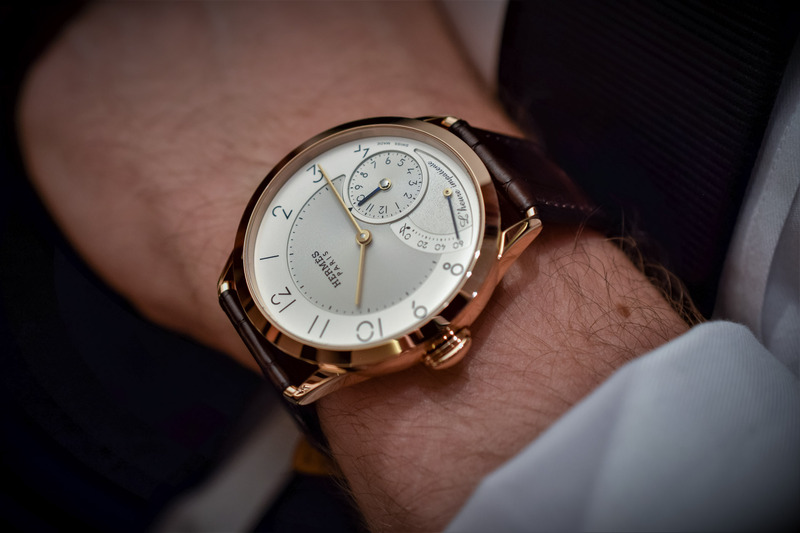 Though I usually favor having a display of the seconds, this dial design is absolutely harmony and elegant.